Pluto - ZineWiki - the history and culture of zines, independent media and the small press. 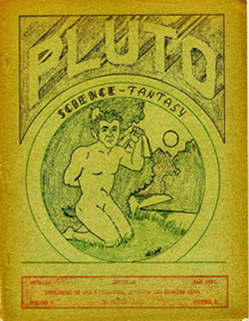 Pluto was a science fiction fanzine published by the The Literature, Science and Hobbies Club of Decker, Indiana, U.S.A. The Club consisted of Marvis Manning, Vincent Manning, Claude Davis, Jr., Maurice Paul, and William Sisson, who were named the 'Decker Dillies' by Bob Tucker, editor of Le Zombie. Edited by Marvis and Vincent Manning for the Club, six issues were released starting in May, 1940, with issue 3 in July, 1940, issue 4 published September 1940, issue 5 in November 1940, and the sixth issue released in January 1941. It was the first fanzine to feature multicolor mimeo work — previously all multicolor work was hekto. Issue 6 was 34 pages and included front cover art by Bob Studley. Articles in that issue included "Wells of Wisdom" by Forrest J Ackerman (Voice of the Imagi-Nation, Novacious) where he details the evening where he met H. G. Wells. Also "Fantasy Farm Footnotes" by Faye M. Manning, "I Like Science Fiction" by Phil Shuman, and poetry and fiction stories by various contributors. Contributors to other issues included Louis Russell Chauvenet (A, Bonfire). The article "Cues From Science" from an issue of Pluto was reprinted in the 4th issue of Canadian Fandom, released September 1943. The letters column, titled "Who Said That", included letters from Damon Knight (Snide), Will Sykora, and H. C. Koenig (The Reader and Collector), among others. "All Our Yesterdays" Chapter 8: Pluto by Harry Warner, Jr. This page was last modified on 21 July 2014, at 22:54.